Geburtshelferkröten (Alytes obstetricans) werden nur ca. 5cm gross und haben Warzen auf Rücken und Flanken. Sie sind in Westeuropa und Nordafrika heimisch. Ihre Oberseite ist gelb, bräunlich mit grünen, roten und schwarzen Flecken und Punkten. Sie sind sehr gesellig, leben in Mauern, Böschungen und manchmal auch Kies- und Sandgruben. Als nachtaktive Zeitgenossen verbringen sie den Tag gemütlich in ihrem Unterschlupf. Das Interessante ist jedoch, dass sich das Männchen um den Nachwuchs kümmert und mit Eischnüren von bis zu 100 Eiern gesehen werden kann, die es sich um Leib und Hinterbeine schlingt. Nach 3-7 Wochen schlüpfen die Kleinen bei Wasserkontakt. Kröten ernähren sich von Würmern, Schnecken (bravo!) und Gliederfüsslern. Habt ihr auch Kröten im Garten? 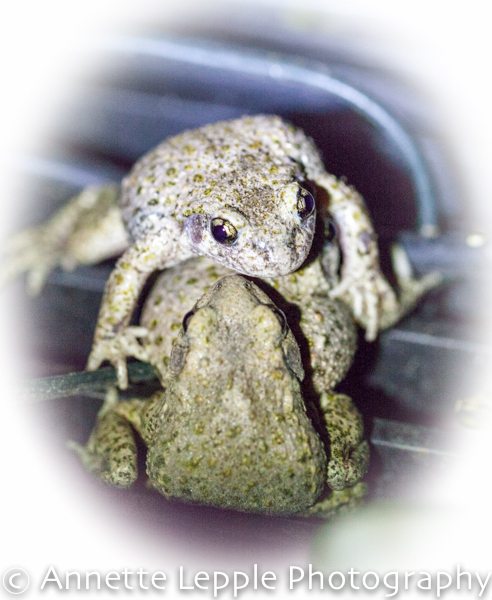 Midwife toads (Alytes obstetricans) grow to about 5cm long and have warts on their back and flanks. They can be found across western Europe and northern Africa. Their upper side is yellow, brownish with green, red and black spots. They’re very social and live in walls, slopes and sometimes quarries. They’re nocturnal and spend the day in a sheltered spot. The interesting thing about them is, that the males care for the offspring and can often be seen with up to 100 eggs slung around hind legs and belly. After 3-7 weeks the babes are born when they get in contact with water. Toads eat worms, slugs (bravo!) and arthropods. Do you also have toads in your garden? das ist ja wunderschön, liebe annette und so interessant! Fascinating. Brave of you to seek them out through the darkness. Don’t think I have toads often. They’re so tiny and don’t do any harm – quite a lot don’t like toads but I think they’re very pretty. No toads in my garden, but when I visited my cousin in St. Lucia, so many toads of all size were out in the evening. The sound they make can keep one up at night if not accustomed to the noise. After being there a while, I got used to it. They are cute though. I found them hard to photograph, as soon as they saw a light go on they were off. Round here it’s only the midwife toads that talk and the frogs of course. Can you specify the genus? Sorry. I can’t tell one from another. I had images on my blog when I was in St. Lucia. Those toads were quick to leave when the lights came on, so I only got a few images. Yes we have toads in the garden here, it’s nice to think that we are all doing something right for wildlife and that they approve of out gardens! We have toads but they make themselves scarce during the day due to the heat and dryness. I set out a flower pot saucer of water for them beneath some plants, but I don’t know that they pay much attention to it! Great photos. I think they’re generally more active at night anyway but it’s definitely tough for them with this heat and drought. Also Geburtshelferkröten haben wir nicht, aber einige Kröten habe ich schon gesichtet, meist fast schwarze Erdkröten, in den letzten Jahren, die sehr trocken waren, sind sie seltener geworden, schade. Great photos of your toads Annette, we have frogs but rarely see toads, maybe one or two, I would like more, they are very good slug predators. 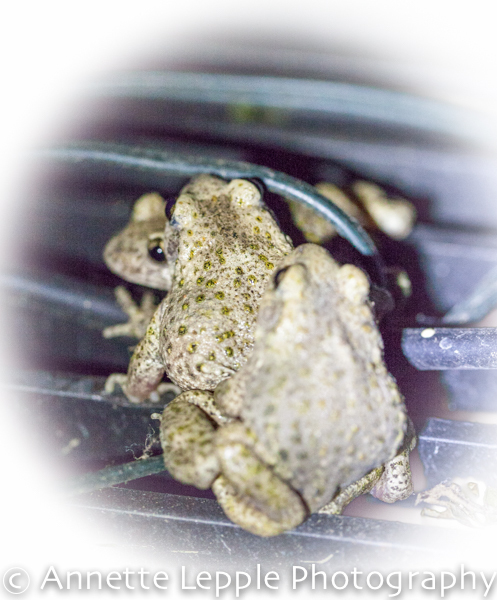 Wonderful toads…ours are either buried or in the pond at night…. 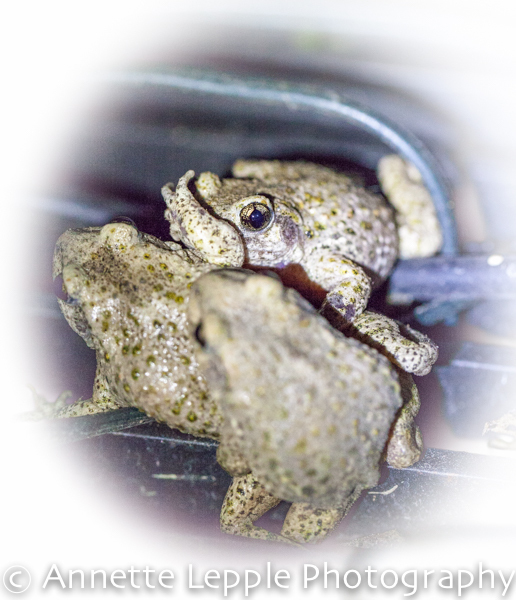 I love your toad photos Annette – I have a couple living in my greenhouse and noticed recently that one seems to have lost a leg – poor thing. I must try & identify them – I notice then hopping away when I am watering. Oh, wie großartig, das zeigt doch immer, dass ein Stück Welt noch in Ordnung ist – dein Stück Welt!!! Geburtshelfer habe ich noch keine wahrgenommen, andere Kröten hab ich und freue mich immer, wenn ich eine entdecke. Lovely pictures of your toads Annette. We don‘ t have midwife toads here, just the common toad, Bufo bufo. Don‘ t you love these tautonyms? sehr interessant, was Du über die Geburtshelferkröte berichtest. Wir haben nur die gewöhnlichen Erdkröten im Garten. Bei der Hitze bekommt man die aber auch nicht zu sehen! Häufig bekommen wir dagegen im Moment unsere Teichmolche zu sehen und freuen uns dann auch immer, wenn unser Garten nicht nur schön aussieht, sondern Lebenraum für Tiere zur Verfügung stellt. Ich versuche dann immer gerne, die Kinder für die Natur zu sensibilisieren und hoffe, dass dies dauerhafte Früchte trägt! Rosige Sommergrüße von Christine aus dem Hexenrosengarten! Wasser haben wir leider auch nicht übrig. Die paar Gewitterregen der letzten Tagen sind alle auf der anderen Rheinseite versackt. No toads in our garden, sadly. No amphibians at all, though I sometimes hear rumors of newts.